Life is slipping by, but there is still time to create a meaningful and impressive life. Your personal growth is your responsibility. No one else has the time or the interest! It's not easy to make positive changes to your life, but it can be done. There are plenty of people that serve as inspirational stories for the rest of us. You can make your life one of those stories. We all might like to have the concentration powers of a monk, but most of us do not. We're distracted by noise, our cell phones, the internet, TV, and many other things. Remove as many distractions from your workspace as possible. Focus on people when they talk to you. 2. Avoid evaluating yourself based on the opinions of others. One hard thing to accept with success is that so few people are happy for you. You can expect to receive a lot of criticism and attempts to sabotage your efforts. Why? Some people don't like you. Some like you, but don't want to see you do better than they are doing. Others are just jealous. A few people don't want to face their own mediocrity. Your sense of accomplishment should be enough. If it's not, change your perspective or choose a more meaningful goal. Begin each day with a list of priorities and do your best to accomplish them each day. You'll need another list the following day. Start each day knowing what needs to be done. Otherwise, where will you start? 4. Focus on a limited number of improvements. You might want to start a business, learn to play the violin, lose 50 pounds, learn French, and take flying lessons, but there's only so much time in the day. Pick a couple of things that mean the most to you and focus your energy there. You'll accomplish much more if you can avoid spreading yourself too thin. What are the three things you'd most like to change about your life? Avoid the other things on your wish list until you've accomplished them. Everything flows from your values. Knowing what's most important to you will allow you to arrange your life in a way that makes sense for you. It will also allow you to set goals that are meaningful. If you don't know your goals, how will you make these decisions? 6. Revisit your goals daily. Have you ever set a New Year's resolution, only to find that you've completely forgotten it a few days or weeks later? The solution is to have a set time each day when you review your goals and keep them fresh in your mind. If you can find the time, twice a day can be even better! Find others who have achieved what you wish to accomplish. It's also important that they started from the same point, or worse, that you're starting from. Take advice from those who are worthy of your attention. 8. Evaluate yourself and your progress. It's not enough to have a great plan and work hard. It's also necessary to evaluate your results. Then, you can adjust and perfect your approach. What changes would you like to make to your life? What areas of your life would you like to see the most growth? 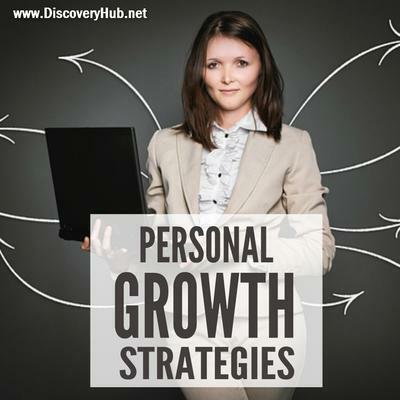 Chose a few growth strategies and try them out in your own life. Be willing to experiment and run with those things that work for you. Take control and build the life of your dreams! Life is challenging, because we have to discover the rules as we go. Some have even argued that is the goal of life: to figure out the rules. Fortunately, billions of people have lived over the years, and at least a few of them have figured out a few things and passed them on. Having a few rules to use as a starting point will guide you towards a life that fulfills you. 1. Hard work trumps all. The world is full of stories of ordinary people that have accomplished extraordinary things. Find something that is meaningful and interesting to you and put all of your effort into that one thing and see where you end up. 2. Let go of things that don't serve you. Are you an executive now? It might be time to let go of those t-shirts with the beer logos. It's not just possessions that you might consider jettisoning from your life. It's also beliefs, hobbies, and negative relationships. Only keep the things and people that matter to you. 3. Stay in touch with friends and family. Once we leave school and start working, most of us lose track of our school friends. Switch jobs, and you lose track of the people from the first job. All along the way, you see your extended family less and less. It's not easy to find people that matter in your life, so stay in touch. A healthy body and mind support everything you want to do in life. Eat nutritious food, get enough sleep, and exercise. 5. Avoid speaking in the heat of the moment. It has been scientifically proven that your ability to think rationally is compromised when you're emotional. That's why it's so easy to say something you later regret. Take a moment and collect yourself before saying anything. 6. End each day with evaluation. Imagine if you could repeat your positive experiences and actions and get rid of the negative. Over time, it would be like compound interest for the quality of your life. 7. Focus your time and energy on the things you can control. There's no reason to waste your energy worrying about anything else. The weather, the behavior of others, and the quarterback of your favorite team are outside your realm of influence. 8. Remember: Money doesn't bring happiness. Money can remove many of the issues that can make life challenging. Money can also pay for a lot of fun. However, studies show that once you make enough to survive comfortably, more money doesn't make you happier. Nearly any good thing becomes negative if taken too far. Going to a party once a month can be a positive thing. Going to a party three times a week probably isn't. Working 40 hours a week is a positive thing. Working 100 hours a week generally is not. You can have too much of a good thing. 10. Be open to new ideas and experiences. Life is very routine if you never do or think anything new. Be curious and experiment with your life. You don't know what you don't know. Life has rules, and many of them aren't entirely clear or logical. Part of the challenge of life is learning and applying the ideas and strategies that will bring you the results you desire. There are many great books on life philosophy and living that can be helpful in your quest to understand life. Continue to educate yourself and develop your own set of rules that help you build a life you love. Then, subscribe to my Power Tips ezine at the bottom of this page so you don’t miss more!